After the recent tariff hike by all leading private operators now its time for India’s National Telecom Backbone Bharat Sanchar Nigam Ltd (BSNL). BSNL all set to charge standard National Roaming rates instead of Reduced Roaming Rates in all basic plans – Per Second, Per Minute and General plan from 26th October, 2012. In other words BSNL customers will pay more for voice calls while roaming! Currently BSNL offering reduced National Roaming Rates like 1.2p /59p/60p for all outgoing and incoming calls for its prepaid customers in Per Second, Per Minute and General plans without any Special Tariff Vouchers for Roaming rates. 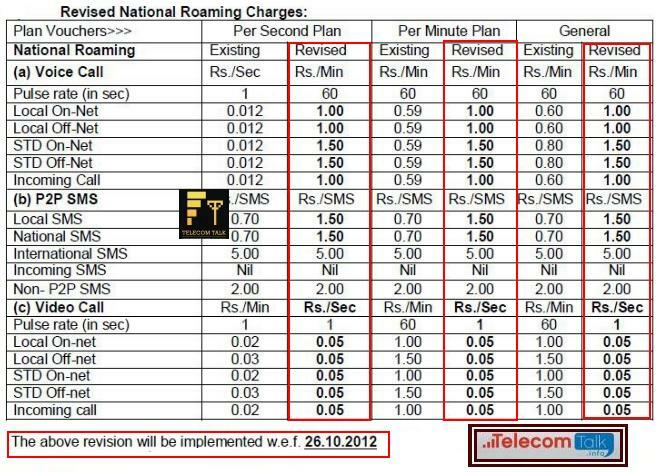 From 26th October, 2012 all BSNL Prepaid customers (2G and 3G) in these tariff plans will be charged for Roaming Calls as per Standared Natioanl Roaming Rates like Rs.1/min for Incoming and Local outgoing calls with in visited telecom circle and Rs.1.50/min for STD outgoing calls while National Roaming. Does India Need to Adopt Speed Based 3G Data Plans ? Hi Sathish can plz tell me how to activate Roam free plan in BSNL andra Pradesh sim ? wat is the recharge amount ? Hi Sathish can plz tell me how to activate Roam free plan in BSNL TamilNadu sim ?